Quietly, slipping through the news recently was the announcement that a London based planning agency (Llewellyn Davies Yeang) just signed a contract to redesign the centre of Najaf, Iraq. Interestingly enough, it is the same firm that was responsible for turning the Milton Keynes in Buckinghamshire (UK) into a model "new town" during the 60's when a surge of families fled London in search of an alternative lifestyle. But, the BBC reports that "by the 1980s Milton Keynes had become a byword for both the pros and cons of post-war British urban planning. It was to some a spacious, modern, landscaped town, and to others a dystopic, soulless home to shopping centres and skateboard parks." Now, the firm is grafting elements of that same masterplan into a redesign of the holy city that today is bankrupt of basic infrastructure and stability. In fact, the UK firm isn't even going to visit the site because Najaf is still so dangerous. Instead, they will work closely with Iraqi partners there over email, using aerial photographs and relayed site data to figure their scheme. Last year, I found an article describing the demolition campaigns that have plagued Najaf for the last 30 years, as a result of Saddam's neglect, and continuing both during and after his removal. Recently, the U.S. appears to regard demolition as a necessary tool for regenerating the city and developing a new urban core. However, Kamil Mahdi warns, "Rushed "development" of the kind being undertaken is frequently accompanied by scandalous financial corruption. It will benefit big contractors and absentee landowners, and the losers are usually the people who live in the city and those who value it, that is all Iraqis." So, (without prematurely knocking this plan, which President Bush believes is a potential model for the redevelopment of the country), why is there so little discussion of Iraqi planners potentially leading a project like this? What would the benefits of that strategy be? Who are the contractors and businesses that stand to gain the most here? Should this "new city" model even be applied? 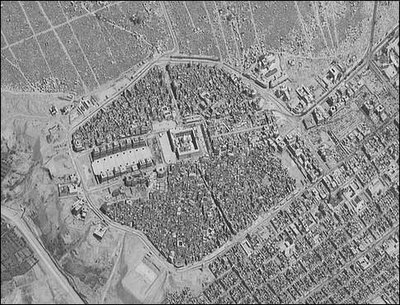 And, doesn't the fact that an ancient Muslim city being redesigned by a British firm -- purely over satellite, nonetheless -- well, just seem...slightly alienating and inappropriate, I mean, given the circumstances right now? At the very least, shouldn't they get the water running first, maybe some more electricity, perhaps even work out the security kinks before cloning a grand commercial masterplan for a holy land over the Internet? Wow. Without weighing in on the pros or cons of Milton Keynes, it does strike me as outrageous that the contract was awarded by the central government in Baghdad. What do the people there want? They're the ones who will have to live with the masterplan. 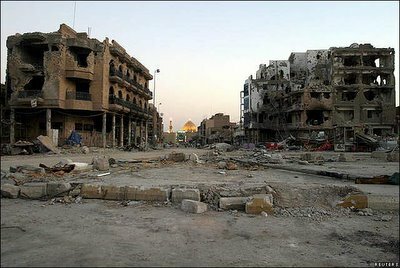 In late January 2007, fighting flared up again in Najaf after Iraqi government and US/UK forces launched an offensive against the Jund al-Samaa (Soldiers of Heaven) militia, the armed wing of a Shia apocalyptic cult.